With 2011 acknowledged as the worst year for elephants since the international ivory trade ban of 1989, it should come as no great surprise that there has been considerable interest and a raft of articles in the media featuring dead elephants in recent months. 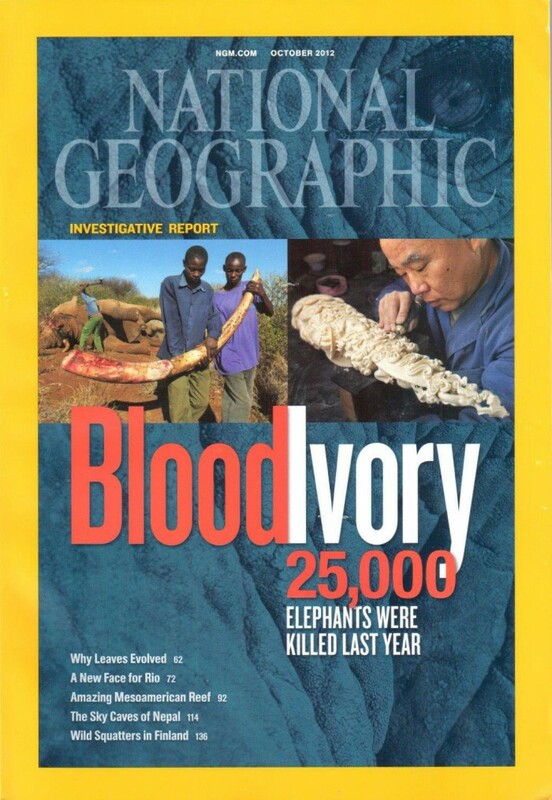 The latest is National Geographic Magazine’s investigative report Blood Ivory, the lead feature in the October issue. Researched and written by Bryan Christy over three years, this is the most thorough and comprehensive assessment of the crisis affecting the world’s elephant populations to be published in a long time. It provides clear insight into the enormity and extent of the illegal international trade in ivory and should prove to be a major game-changer in advance of the next meeting of the Conference of the Parties to the Convention on the International Trade in Endangered Species (CITES) in Bangkok in March 2013. Christy is also highly critical of the global ivory trading system operated by CITES and offers some measure of vindication for the longstanding and frequently articulated view of the Environmental Investigation Agency (EIA) that the CITES ivory-trading mechanism is profoundly flawed, empirically unsupportable and has itself become a major driver of poaching and the illegal international trade in ivory. Two one-off ivory sales have done nothing but perpetuate demand for ivory, both legal and illegal. The international ban on trade in ivory – in which EIA’s investigations and findings played a key role – was put in place in 1989 at the end of a 10-year period during which at least one elephant died every 10 minutes. However, in less than a decade CITES had agreed to a compromise, allowing a one-off sale of stockpiled ivory from Zimbabwe, Botswana and Namibia to a single buyer, Japan. At the same time, and in order to determine the success or failure of the ‘Japan experiment’, CITES decided to use ivory seizures as a tool to estimate smuggling activity and engaged the NGO Traffic to audit them through its Elephant Trade Information System (ETIS). In 2000, EIA published the report Lethal Experiment which cautioned that the ‘experimental’ sale was deeply flawed since promised safeguards to evaluate the impacts were not in place and “the 1999 international ivory sales were effectively an experiment without control”. Elephant range states such as Kenya expressed concern that China was emerging as a major new market for illegal ivory. EIA’s investigations in 1999 and 2000 supported this concern, identifying China as a major recipient of smuggled ivory and underlining the real threat posed by any further CITES-authorised international trade in ivory. The widespread availability of ivory products and the increasing number of seizures destined for China were clear indicators of a thriving black market in ivory and growing local demand. All these warnings fell on deaf ears. In 2002, China itself told CITES that the ‘Japan experiment’ was the main cause of its growing ivory-smuggling problem because the sale had confused Chinese consumers, leading them to believe the international ivory trade had been resumed; its warning was ignored and CITES instead continued to put its faith in the ETIS statistics. An ETIS press release that year stated: “In terms of global ivory trade trends, the ETIS reports indicate that ivory seizure volumes progressively declined from 1989 to 1994, remained stable at 1994 levels through to 1998, but have been on the increase ever since”. The sale to Japan was agreed in 1997. Christy’s analogy of the sale to Japan is that having approved the sale, CITES had then “set about constructing a way to gauge its impact, which is a bit like pushing the button to test the first atomic bomb and then building a device to measure the explosion.” No enforcement baseline had been established to cope with the sale. In fact, the scope of the enforcement assessment prior to the decision was totally inadequate and failed to take into account the transnational dynamics of the criminal networks and militia groups that were engaged in poaching and trafficking prior to, during and since the sales. A few years later, China had changed its tune and petitioned CITES to make it an approved buyer, triggering a second one-off sale of ivory in 2008 – a significant factor behind the catastrophic rise in elephant poaching in the following three years. This slaughter continues today. 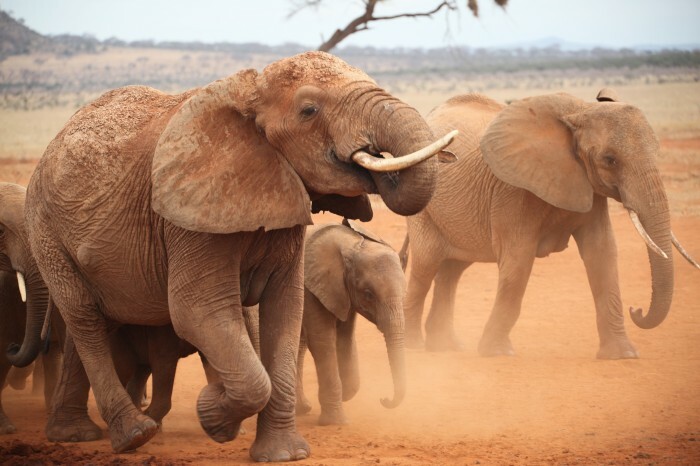 Following the 2008 decision to award China approved buyer status, ETIS was once again mandated to determine whether the second sale led to an increase in illegal ivory trade. Contrary to the facts and to the 2002 ETIS statement, ETIS Director Tom Milliken told the BBC at the time: “Following the last one-off sale under CITES in 1999, it is encouraging to note that the illicit trade in ivory progressively declined over the next five years … we hope a similar result is achieved this time”. It seems that a great many CITES players – governments, CITES personnel, NGOs – have become so wedded to the concept of sustainable (read ‘lethal’) use, that they refuse to take into account criminality and corruption as key factors in the real world. It makes no difference to the criminals and corrupt officials engaged in ivory poaching and trafficking whether a number of consignments in southern Africa have been ‘securely’ loaded into a container and ‘securely’ unloaded and monitored at the other end. Where is the deterrent in that? Especially when it transpires that the Government of China, out of greed, conspired to create a space in which the illegal ivory market could flourish below the profit margins of the legal ivory, as evidenced in EIA’s investigations in 2010 and highlighted in Christy’s Blood Ivory. The pressing question is, will CITES have learnt anything from this? Will our own Government, which supported these sales, take a step back and see how blindingly obvious it is that all which could and should be done in relation to enforcement has not yet been put into practice? The parties to CITES should be looking for adequate evidence that they are investing in intelligence-led enforcement, multi-agency operations, securing convictions and raising penalties – including the seizure of assets and proceeds of wildlife crime – and communicating and cooperating internationally. If they cannot muster the commitment and political will to ensure adequate enforcement, communication and cooperation between national and international police, Customs and prosecutions offices, then how in all honesty can they seriously expect the international community to endorse CITES as a responsible guardian of endangered species and allow it to continue making life and death decisions affecting wildlife, communities and livelihoods? • Read the National Geographic article here.